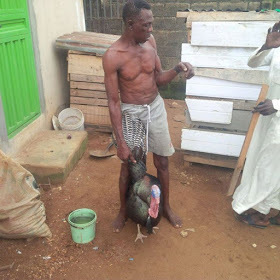 An elderly man who stole 8 live turkeys in Iju/Agege area on Wednesday has been apprehended. He was apprehended around 3.00am by members of the OPC. He was asked where he got them from but said he bought them from the market during the day and forgot to bring them down from his car. They however still held him till morning as they marched him down to his house. Soon as the day broke, a woman was heard screaming on the streets shouting her Turkeys have gone missing, and that was how the OPC men arrested the ‘thief’ properly.